Posed photo of patient, surgeons and nurses. I grew up watching episodes of M*A*S*H*. Next to Star Trek, I'd say it was the most influential (and most intelligent) TV show I watched in my youth. Imagine my interest when I found out that the first mobile army surgical hospitals (not known as the famous acronym of course) emerged during the Civil War. With these Field Hospitals came the apparent butchery of speedy operations that M*A*S*H* viewers know as "meatball surgery." 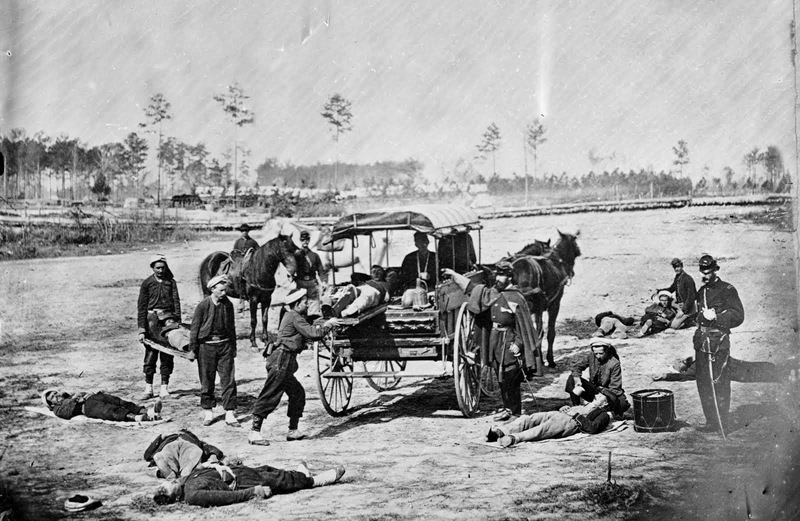 The Army Corps Field Hospital, the Ambulance Corps and the Army Nursing Corps had their start in the Civil War. 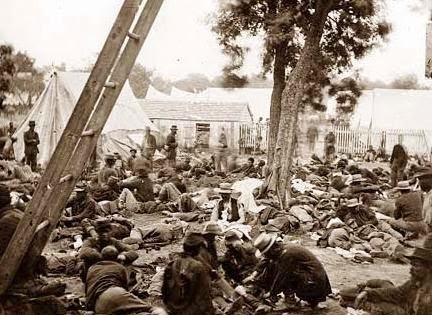 Triage was invented. New surgical techniques were developed. 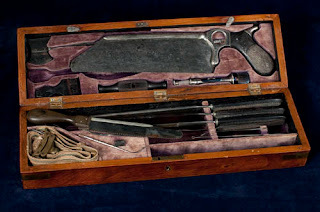 Spearheading these innovations was Jonathan Letterman, the medical director of the Army of the Potomac, aided by General George McClellan and Surgeon General William Hammond. 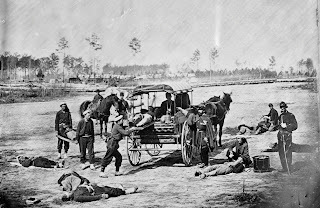 All three men were forward thinkers willing and ready to reform the haphazard way the wounded were removed from the field and treated afterward. Letterman also instituted policies regarding camp and hospital hygiene which might have saved more lives than surgery. The reality of field hospitals. Disease killed more soldiers than combat wounds. Dysentery topped the list and it could by largely avoided - or at least contained - with proper hygiene. Although it wasn't until after the war that Pasteur's proof of the existence of germs was widely known, anecdotal evidence tied disease to human feces contaminating the water supply. Many changes in battle field medicine came out of the trial and error of surgeons in the field. 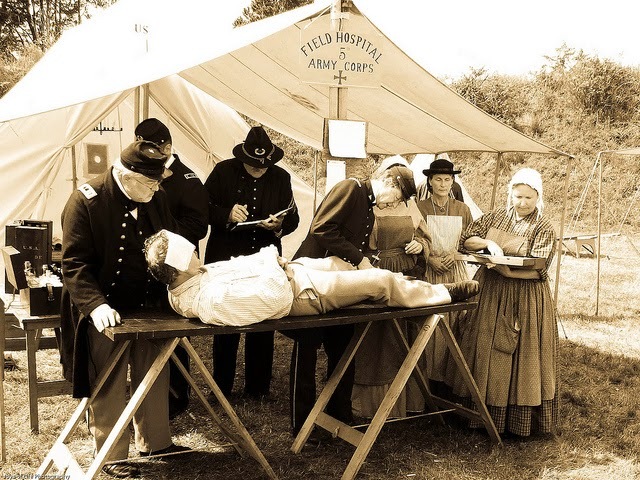 Of the physicians recruited by the Union Army, only a small percentage were qualified surgeons. Most had to learn as they went. One of the first things they learned was they didn't have time to pick out bone, metal and cloth debris from a shattered limb. It was faster, and safer for the patient, if they amputated. Not only was there less chance of the wound becoming septic, but many more patients could be seen and saved. This was often seen as butchery. It didn't help that field surgery was performed out in the open as much as possible. The light was better and the air fresher. Anesthesia, at the time, knocked the patient out, but it didn't immobilize him. Patients would twitch and groan during surgery, and needed to be held still, making it seem as if they were being tortured rather than saved. Although he didn't invent the surgical techniques used, Dr Letterman heartily endorsed them and criticized the practice of "conservative surgery" where too often the limb was saved and the patient lost. He could see what needed to be done and he did it, with the object of saving as many lives as possible. 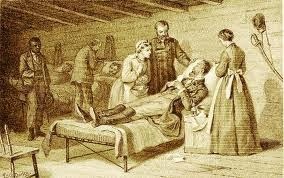 This meant restructuring how everything was done from battlefield aid to hospital care. Called the Letterman Plan, he pretty well set army medical protocols that would be used up to the Korean War at the very least. I often wondered whether, had I been confronted with the primitive system which Letterman fell heir to at the beginning of the Civil War, I could have developed as good an organization as he did. I doubt it. There was not a day during World War II that I did not thank God for Jonathan Letterman. It's not hard to imagine a 19th Century Dr. Benjamin Franklin (Hawkeye) Pierce working in a Civil War field hospital. Even his name is perfect. No doubt he would berate any substandard surgeons and train up any talented surgical assistants. He'd work insanely long hours during and following battles, keeping up the spirits of his fellows with inappropriate black humor. When he had the chance, and could get away with it, he could even flirt (gallantly of course) with the beautiful nurses. At the time, the nurses were actually required to be "more than 30 years of age, healthy, and plain almost to repulsion in dress, and devoid of personal attraction." But in wartime, that might pass for gorgeous. In any case, a little dramatic license is always appreciated. WHAT WAS IT REALLY LIKE IN THE OLD WEST? 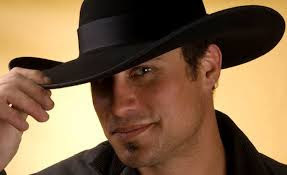 I love to write about the Old West, about cowboys and ranchers and the exciting lives they led. Researching my stories gives me pleasure. Reading the historical romances of my friends brings me relaxation and satisfaction. They are a mental vacation from today’s stress. But what was it really like to live in the Old West? 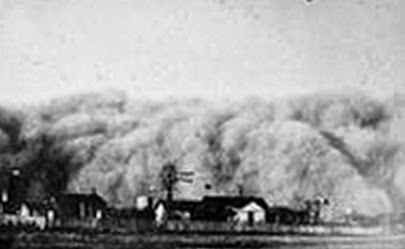 My work in progress features three adults and three children in an 1888 Texas dust storm. Any of you who have ever lived in the Southwest know how dreadful a dust storm can be. Not sand, but fine dust that seeps in through the tightest windows and doors. Except for six years in California as a child, I grew up in West Texas. We had some doozy sand storms that would sting your skin if you happened to be outside. And this was in prehistoric times when girls could not wear jeans to school and we had to walk home with sand stinging our bare legs. Ugh, those were NOT the good old days. We also occasionally had a bad dust storm. The first one I remember was when I had just turned eight. We had just moved back to Texas from Bakersfield and the dust started blowing in the afternoon. Because I was asthmatic, my mom wet sheets and hung them at the windows of my room. She didn’t bother to do the same in her and Daddy’s bedroom. The next morning when they woke, my mom started laughing at my dad. Fine gray dust covered his face, like grayish-brown talcum. When he raised his head, she could see the outline of where he’d lain. He asked her why she was laughing and she told him he looked as if he had on some kind of stage make up. He told her to go look in the mirror. She was shocked to see she looked the same and her brown hair was beige. I still remember the surprise of seeing their outline on the pillows before I was banished back to my room. About ten years ago, my husband and I were visiting his mom in Lubbock, where she lived in a beautiful, new assisted living complex. The sky grew dark and we thought we were in for a thunderstorm. No, it was roiling clouds of black dust from who knows where? The dirt around Lubbock is reddish-brown and further west the soil is tan. This was black and fine, like tons of obsidian talcum powder smothering us. Her apartment had double-paned windows in metal frames. That storm must have sucked all the oxygen from the air, because I started choking up. I don’t have many asthma attacks now that I’m an adult and know what to avoid, but I had a severe attack then. We had to cut our visit short and hurry out of town or go to the emergency room. We left. From our family history, I have a transcript made from the oral interview of a woman born in 1890, a relative of my dad’s stepmother. This woman recounted a move from Texas to southwestern Oklahoma in 1899. They had a tent with them and found an abandoned dugout to use until their home was built. One of the boys had asthma and was just recovering from pneumonia. The musty smelling earth kept him from living in the dugout, so he remained in the tent. One day the women in the family had put all the bedding out to air. The father and boys came rushing home from the fields because they thought the black cloud on the horizon was a grass fire, a terrible thunderstorm . . . or the end of the world. 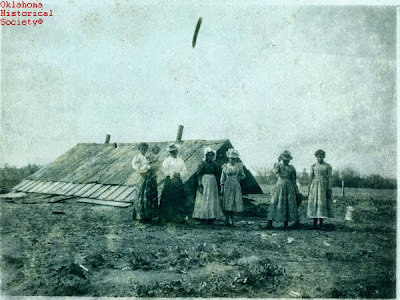 These people lived in an isolated area with few resources. The wind struck and a terrible dust storm engulfed them. Afterward, they recovered the tent, some of their bedding up to a mile away, and never saw some of it again. Whew! And that was before the infamous Dust Bowl. 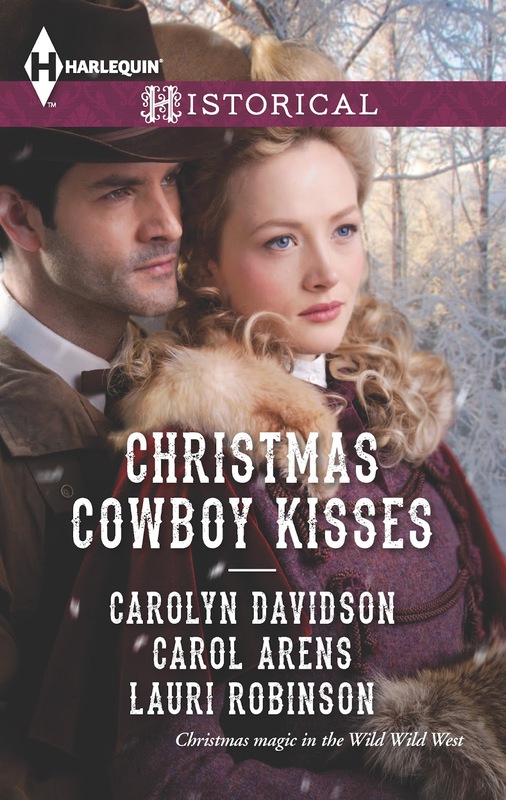 In my current story, THE MOST UNSUITABLE COURTSHIP (to be released in October), the adults are as uncomfortable as you would expect of anyone caught in a dust storm on the prairie. But two of the children have asthma, one severely. This made me wonder about pioneers like those above from my step-grandmother's family. My husband and I have taken turns sitting up nights with our asthmatic children (or sitting with one child when they were both ill at the same time), we learned to give respiratory therapy to them, and we monitored their diets, shots, and medicines. With all that, we still felt helpless when they were sick. How horrible it must have been to have a child gasping for breath with no help in sight. No emergency room, steroids, or modern medicines. No wonder so many children died in infancy. I love to write and read about the Old West. I'm glad I missed out on the real Dust Bowl. I give thanks that I live in the New West. My mother always said this, while raising six kids in the 1950-1960s. She chose to leave a bank clerk job and be a housewife. My grandmother, raised on a farm, worked in an office as a typist before getting married and staying home to raise her family. That trend went back to the 1800s, when girls were raised to marry and have children. Many chose to work first at a job before settling down with a husband. Many didn't have a prospective suitor. Or didn't want one. But there wasn't much to choose from in terms of paid employment at the upper level of salary choices. Men dominated the professions such as being a physician, a lawyer, owning a business, etc. Of course, there were exceptions - but for the most part, women worked as domestics (maids, laundresses, cooks) or in factories or at home, often paid by the piece, either stripping tobacco, picking nuts, producing silk flowers or sewing, making lace, etc. They sometimes worked in millinery and dressmaker shops, or ... as teachers. It seems fitting, being September, to talk about women working as teachers. Harriet Beecher Stowe's sister, Catherine Beecher, born in 1800 in a prominent family of social reformers, was self-taught and believed that women were natural teachers. Catherine became one in 1821 and was a co-founder of the Hartford Female Seminary - where women were trained to be mothers and teachers. She also believed that teaching was far more important than the work of a doctor or lawyer - something I agree with - although she never supported suffrage. Still, for the early 1800s, she spurred progress for women to further their education and then pass that knowledge to children. In urban schools, women taught and men were superintendents or principals. In western rural areas, men might have taken the lower pay of a teaching position if they had no other choice. School districts might have hired a man to teach the older children and a woman to handle the younger ones. If they could afford both, that is, depending on the school and settlement. And most schools were one-room, handling up to sixty children. Often there was little extra money for slates, books or even coal or wood for the stoves to heat the small schoolhouses in poorer settlements. Reading - utilizing the Bible, early primers or later MacGuffey's Reader - and grammar, arithmetic, geography and history were taught in schools, sometimes by teachers who had barely learned the same lessons. But while many consider the quality of lessons as basic or primitive, consider today's trend to skip spelling and grammar lessons (disappearing unfortunately). The extensive "figuring" lessons in measures and weights, basic accounting and other necessary math was vital to running a farm or a keeping a business afloat. Women in the field appreciated the chance to live an independent life, and to earn wages - even if on a temporary basis before marriage. By the turn of the century, 75% of teachers were women. My husband's aunt worked in a one-room schoolhouse with children ranging from kindergarten to eighth grade. She swept the steps and classroom every day, fetched coal for the heating stove, brought extra food for kids going without breakfast/lunch (during late Depression) and handled discipline - but the children loved her since she made it fun to learn. 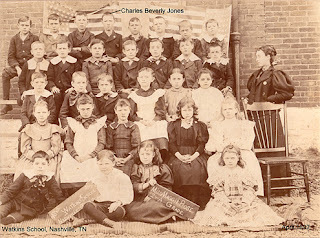 To the right, a class of thirty children, possibly the same age (easier than thirty all at different grade levels), and their female teacher - at the Watkins School, Nashville, Tennessee, late 1800s. Today, women still dominate the teaching profession. They do have the advantage of earning pensions, benefits and fairly decent wages - although for the work involved, they are still not paid enough (in my opinion.) We all have memories of our favorite teachers. God bless them all. 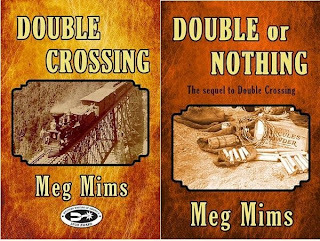 Meg Mims is an award-winning author with two western mysteries under her Eastern belt. She lives in Michigan, where the hills are like driveway slopes and trees block any type of prairie winds. 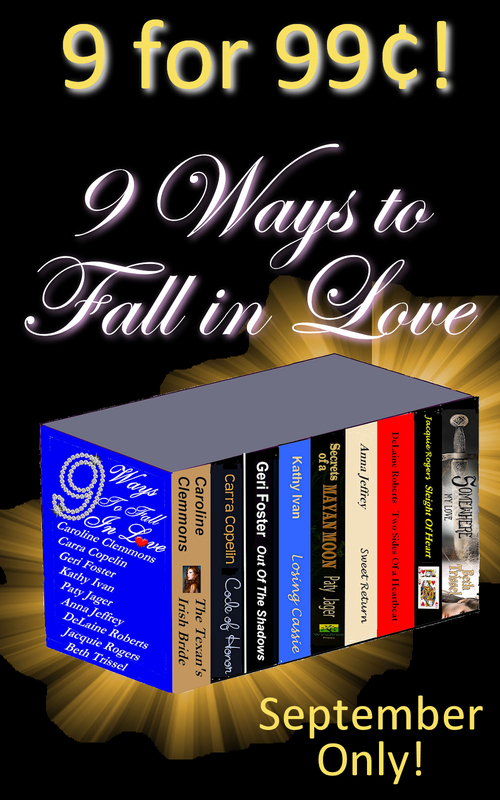 LIKE her on Facebook, follow her on Twitter or check out her books on her website. 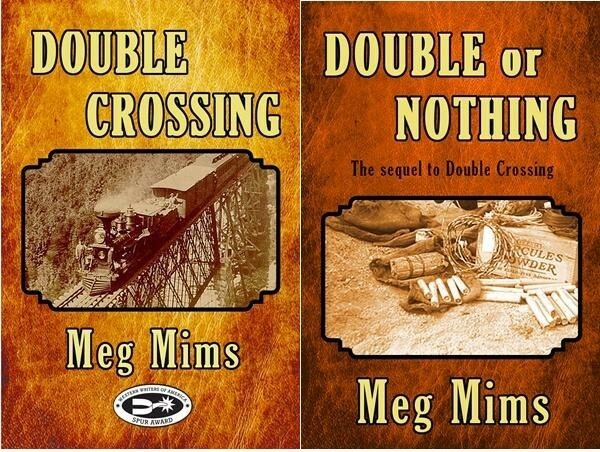 Double Crossing won the 2012 Spur Award for Best First Novel and Double or Nothing is the exciting sequel. My husband and I are planning a trip out to Montana and Wyoming this fall, and though we will not be going to Cheyenne (we’ve already been to the southern parts of Wyoming) I hope some of you might find this post about Cheyenne’s Plains Hotel interesting. In 1878 Laramie County Wyoming was named the wealthiest county (per capita) in the United States. The lush grasslands and mild winters had allowed cattle companies to flourish surrounding the community that had been established while the railroad was being built ten years before. Lavish homes and prosperous businesses filled the town claiming to provide comfort and a touch of elegance. The elegant accommodations of Cheyenne—known as ‘The Magic City of the Plains’—catered to cattle barons, oil men, and travelers on their way to see the legendary Yellowstone. Shortly after the turn of the century, a new hotel was planned and built downtown. Completed in 1911, the Plains Hotel, cost $250,000 to build and furnish. The modern hotel hosted three elevators, velvet carpets, private baths, and had telephones in the 100 guest rooms—luxuries that had never been heard of before. Legend has it, shortly after the hotel opened a couple chose to honeymoon there. The story claims that one evening the groom went down to the lounge, upon where he met a ‘soiled dove’. His wife, ‘Rosie’, evidently tired of waiting for her groom to return, went downstairs as well, where she witnessed her husband and said soiled dove leaving the lounge. Rosie followed them to a fourth floor room—the ‘other woman’s' room. There Rosie proceeded to shoot, and kill, both her husband and his newfound lady friend. Rosie then returned to the honey-moon suite and turned the gun on herself. Numerous accounts of seeing the spirits of Rosie, her husband, and the soiled dove have been made by employees and guests ever since the tragedy. Housekeeping staff have claimed to hear a woman crying (even after all the renovations to the hotel) in the room Rosie and her husband once occupied, and Rosie has been seen walking the second floor halls in a long blue gown. Her husband seems more restless, he’s appeared everywhere from the basement to the top floor. He wears a long black coat, black boots, and a white shirt with a large silver top button. The soiled dove—yes, she’s there, too, wearing a short red dress with white lace. It’s said that one time the hotel was decorated for Halloween and had two mannequins dressed up as a bride and groom in the lobby. A hotel worker claimed to have seen the ‘soiled dove’ nearby and the next moment, the bride mannequin toppled over. The Plains Hotel is still in operation today, with 130 fully restored guest rooms that are decorated in an “old west” style. Tanner Maxwell tugged his hat down and flipped the collar of his coat up to protect his ears from the biting wind whipping around the corner of the depot. Planting the sole of one boot against the wooden building behind him, he crossed his arms and leaned back. The judge must have drawn straws. No one would have volunteered for this job. Tanner sure hadn’t and assuming he was the short straw didn’t help his temperament. Neither did the gray sky or the bits of snow swirling about. Hauling Anna Hagen back to the ranch was going to be unpleasant enough; he sure didn’t need a storm to fight along the way. If you lived in the Old West, what products would you need? want? 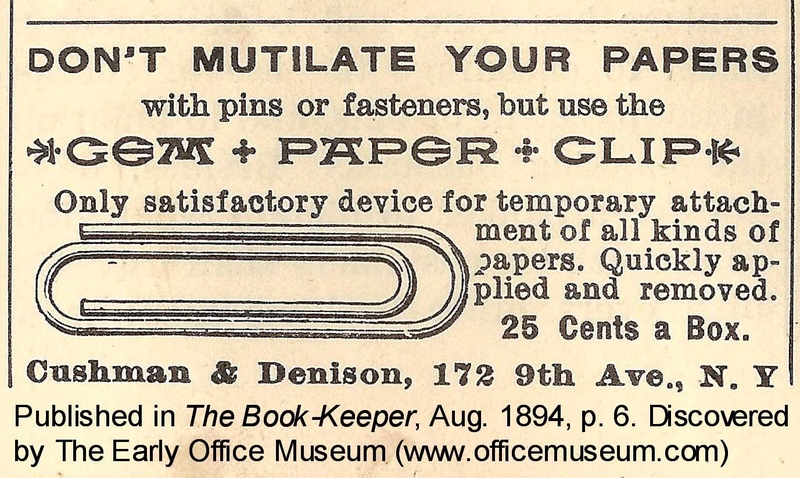 Seems to me that people haven't changed much--we want great looking hair and skin, fashionable clothing, and functional tools to make a living. 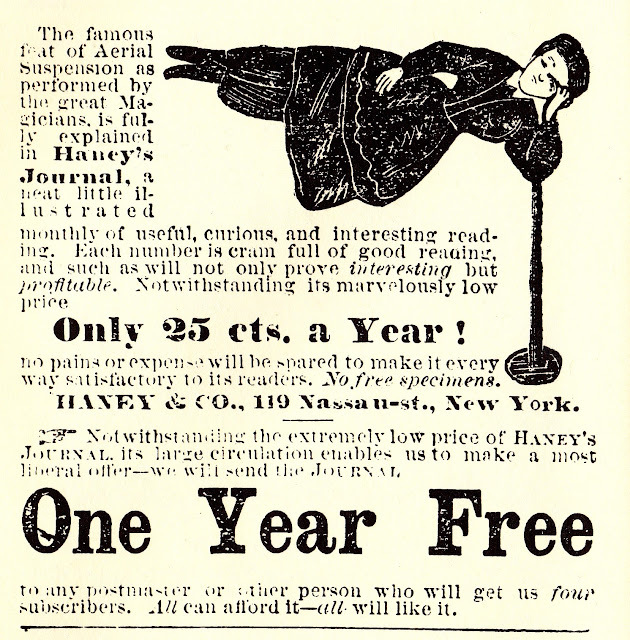 We can learn a lot about people who lived 150 years ago by looking at the ads in period newspapers and magazines. People need entertainment. In the frontier, they had to devise their own. Imagine the young man who impresses his girlfriend with magic tricks. ☺ Here's an ad for Haney's Journal, which promises that and more. Everything more, actually. And that's the theme of most advertising--one product does whatever you need it to do. 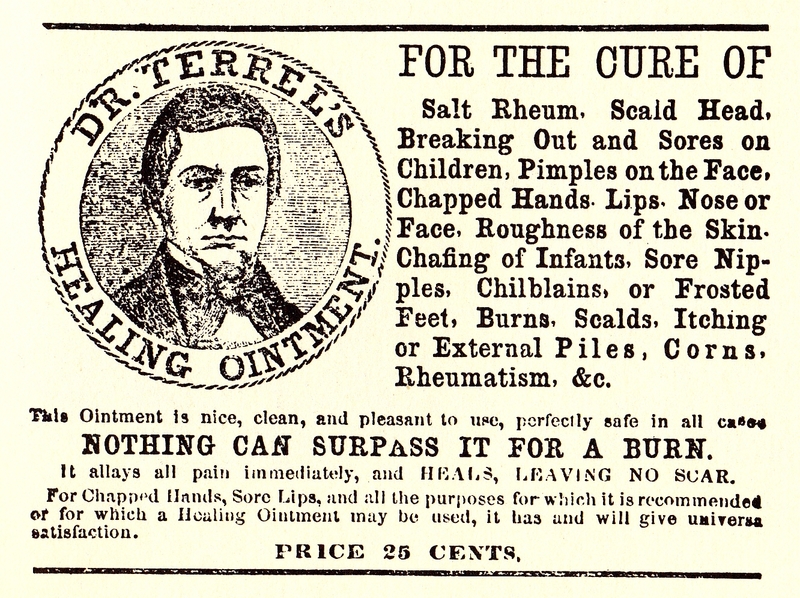 And so it goes with Dr. Terrel's Healing Ointment. 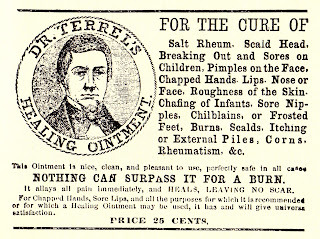 It cures everything from chapped lips to piles, and guarantees "universe satisfaction." Newspapers were full of curatives that claimed wondrous healing powers. 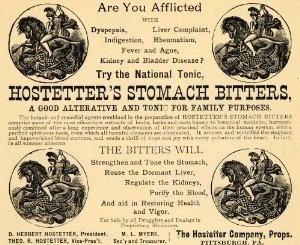 I used Hostetter's Stomach Bitters in Much Ado About Marshals. The widows, Mrs. Courtney and Mrs. Proctor, were both addicted. I use this as comic relief, but it was a real problem since many of these patent medicines contained opium and other addictive drugs that are illegal or regulated today. Along about the 1880s, commercial tooth powder became part of good grooming, although still not readily available. Here's an ad about Rubifoam. How do you hold your papers together? 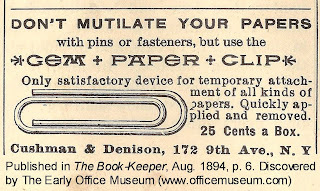 In 1894, they used Gem Paper Clips. 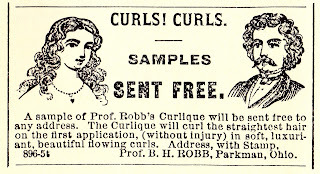 Everyone likes to have nice looking hair, no matter which period in history you study. 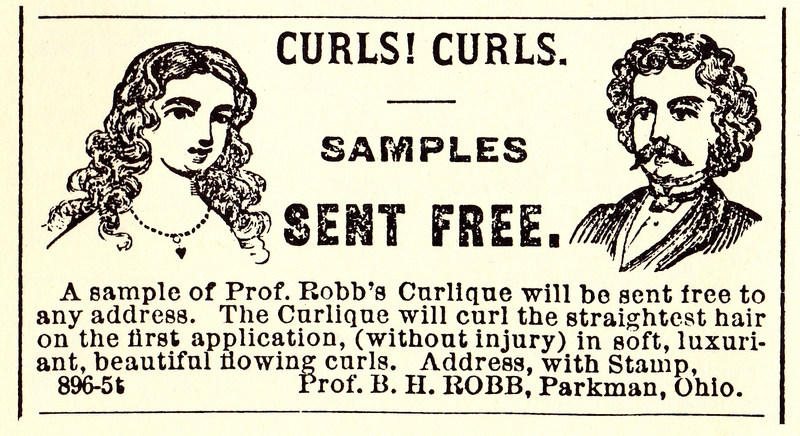 This is an ad for Prof. Robb's Curlique from 1870, and promises "beautiful flowing curls." I find it interesting that this product was aimed at both sexes. Men's desire for more, um, vitality certainly wasn't invented by Viagra. Dr. Liebig's Manhood Restorer gave me a fun scene in Much Ado About Marshals. (I'm not saying any more about that!) This ad goes on and on, almost the entire length of the newspaper. It's not all that easy to read, but if you can manage, it's quite entertaining. And of course there were other products for the same purpose. 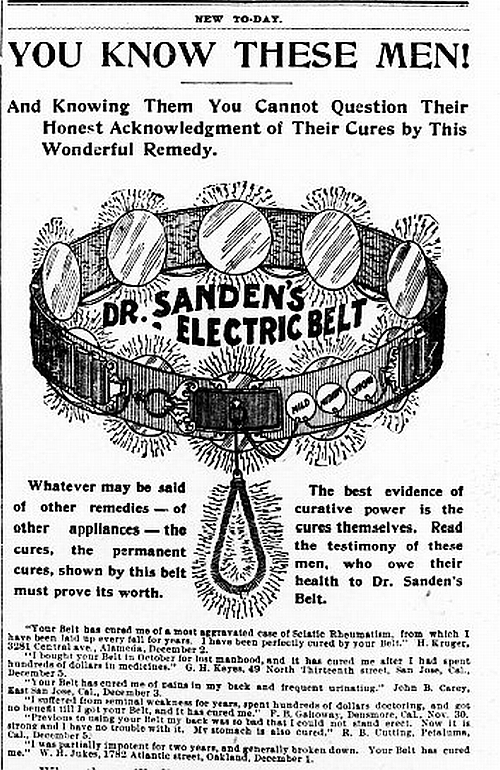 Here's Dr. Sanden's Electric Belt--not so sure most men would want this on their tender bits, but it promises to be a "Wonderful Remedy" for Sciatic Rheumatism and Lost Manhood. And probably anything else you could think of. The ladies wanted their enhancements as well, and I use these in a book to be released next year. 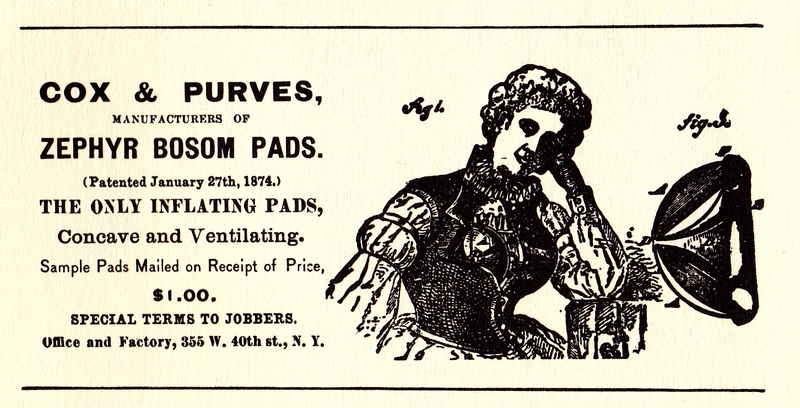 In 1870, Cox & Purves provided Zephyr Bosom Pads to help those less endowed with "The Only Inflating Pads" that were "Concave and Ventilating." 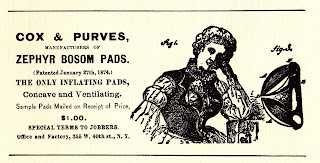 So there you have it--a sampling of the plethora of ads that tell us a little something about what 19th century citizens. Starched-up Lexie Campbell, more comfortable with neat and tidy numbers than messy emotions, must find the man who ruined her little sister and make him marry her. When his lookalike brother Burke appears, she greets him with a gun and forces him to help her. Smooth-dealing Burke O’Shaughnessy, riverboat gambler and prestidigitator, must find his brother Patrick to claim the family fortune. But when Lexie shows an astounding talent for counting cards and calculating odds, he figures she might be useful after all. Can he resist the queen of hearts? In searching for a topic for this blog, I came upon a mention of women’s suffrage in Utah, and an amazing woman who played a large part in the movement. Since I live in Utah, I decided it might make an interesting topic. Emmeline B. Wells, Utah’s “foremost woman” was born in 1828 in Petersham, MA. Her family must have been well to do and quite intellectual, for Emmeline was given an unusually good education for a woman at that time. She graduated at age 14 from the New Salem Academy and taught school for a short time. In 1842, she converted to the Mormon Church, and a year later married James Harris. The couple migrated to Nauvoo, Illinois in 1844. After losing her son and her husband, Emmeline married Newel K. Whitney as a plural wife, and traveled to Utah with the Whitney family in 1848. Just the ability to survive that journey alone shows how strong a woman she was. But life had more hardships in store for her. A few years later, Whitney died, leaving her with two daughters whom she supported by teaching school. As editor of the Exponent she used the publication for thirty-seven years to support women’s suffrage and educational and economic opportunities for women, as well as to report news of the Mormon Women’s Relief Society, which she served as general secretary for several years before becoming president in 1910. For nearly thirty years she represented Utah women in the National Woman’s Suffrage Association and the National and International Councils of Women, at the same time spearheading the effort to include women’s suffrage in the Utah state constitution. She wrote numerous short stories and poems, mostly published in the Women’s Exponent. In 1912, she became the first Utah woman to receive an honorary degree from Brigham Young University. Along with all her other activities, Emmeline served as liaison between Mormon and non-Mormon women and helped to dispel much of the hostile criticism of her people. It was at the time of her death, in 1921, that she was eulogized as the state’s “foremost woman,” as “unyielding as her native granite in her devotion to duty.” Today, you can find a bust of her in the rotunda of the Utah State Capitol building, the only woman so honored. Female suffrage was passed by the Utah territorial legislature in 1870, thanks in part to Emmeline’s great efforts. Actually, the right of women to vote was won twice in Utah, having been granted first in 1870 as mentioned above, but revoked by Congress in 1887 as part of a national effort to rid the territory of polygamy. In 1895, it was restored when the right of women to vote and hold office was written into the Utah constitution. Emmeline has proven to be a fascinating subject, for she was not only one of the most influential women of the 19th Century, a friend of Susan B. Anthony, she was also entertained by Queen Victoria, and received a personal visit from President Woodrow Wilson. What I find truly amazing about her is the fact that, besides all her hard work for women’s suffrage and her various church offices, Emmeline managed to triumph over solitude, life-long depression, social ridicule over being a polygamist wife, and religious persecution. She was a woman who needed to be loved, and who struggled, like so many of us, to find her place in the world. Of all the women I’ve ever encountered or read about, Emmeline B. Wells must surely be one of the strongest both physically and mentally. How else could she have endured all that was thrust upon her in her lifetime? There is so much more I could have written about this one-of-a-kind woman, but being short on space, I’ll leave you with this poem which she wrote. Till around falls the silence of midnight. Tired footsteps at last guided right. To the innermost depths of my heart. How 'bout a DOG for the holiday?